What a fun filled Girls only weekend in the Kootenay's. Everything a girl could want. 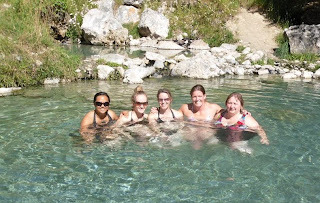 Day 1: I drove the 5 of us 45 minute up a logging road to the top of the mountain to a beautiful hot springs. There was only one other person there who didn't stay long and then we had the place to ourselves but before the guy left he filled us in on some info. 1. You can make the water gush out of the pipe fast if you plug it up for a minute (of course we tried it once he left), 2. 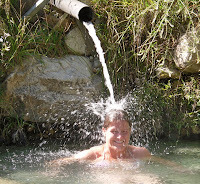 The water temperature was 34 degrees (so warm and perfect for the summer) 3. At night people come and light candles around the rocks 4. Watch out for poison ivy in the bushes around. 5. He asked if we would be ok with him skinny dipping and Lindsy was quick to say "I'm not ok with that" so he left!